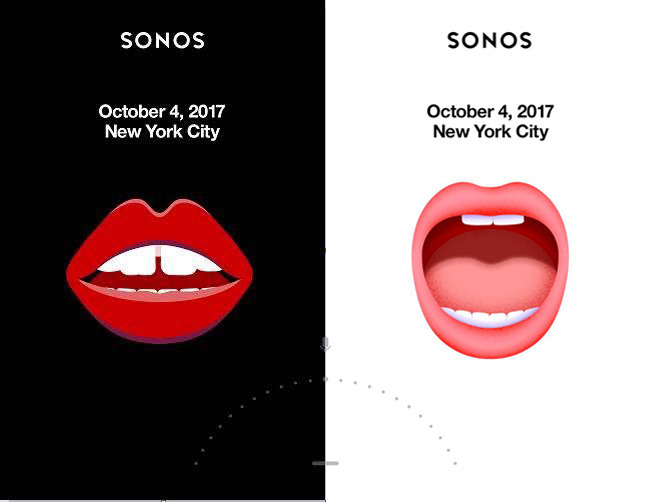 Sonos on Tuesday sent out a media invitation to an Oct. 4 press event in New York City, where the company is expected to reveal its all-but-announced smartspeaker with support for voice commands. The invitation includes an open mouth, as well as part of a previously-seen controller image with a microphone icon, TechCrunch noted. It otherwise offers no product details. In documents published on Monday by the U.S. Federal Communications Commission, however, Sonos detailed a "high-performance all-in-one wireless smart speaker" that "adds integrated voice control functionality with far field microphones," including support for "multiple voice platforms and music services." It's expected the device will at least include Amazon Alexa, but could also support Google Assistant, Microsoft's Cortana, and/or Samsung's Bixby. Siri will almost certainly be excluded, since Apple has so far limited that assistant to its own hardware. It's also preparing to ship its own smartspeaker, the HomePod, in December for $349. Sonos's product could pose a direct challenge to the HomePod, since both companies are aiming at a high-cost Wi-Fi audio market. The firms have been close partners in the past, in fact giving Sonos speakers a prominent place in some Apple stores.